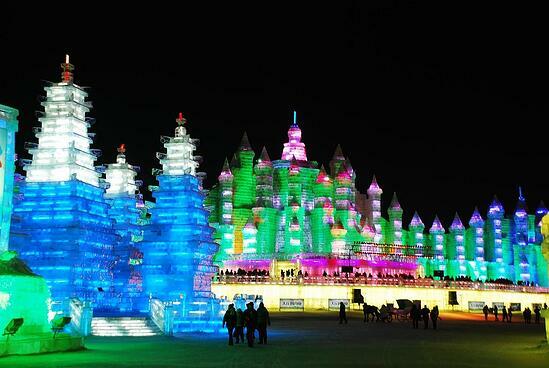 China’s Harbin Ice and Snow Festival is the winter festival of your dreams. Picture this: sweeping snowscapes filled with towering ice sculptures, illuminated by brightly-colored, twinkling lights. Children slide down the side of spectacular ice skyscrapers that make up this expansive Ice City, covering 148 acres in China’s northeastern city of Harbin. Everywhere you turn, winter fun is unfolding - from families riding sleighs down the frozen Songhua River to the world-famous ice lantern art fair. Sound like something out of a fairy tale? From early January to late February, the city of Harbin in Heilongjiang, China transforms into one of the world’s most dazzling winter festivals. With breathtaking ice sculptures, full-sized, interactive ice architecture, and four fun-filled theme parks, here’s everything you need to know about this world-renowned winter festival. 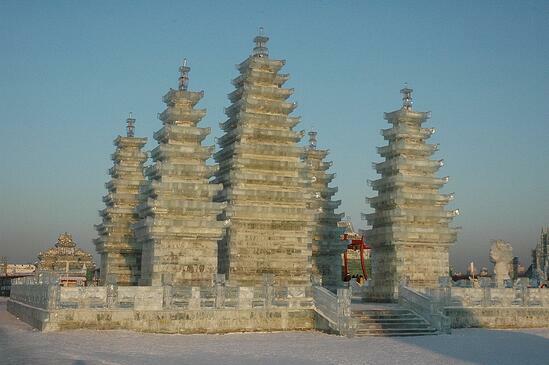 It is the world’s largest ice and snow festival. Now going into its 33rd year, Harbin’s winter festival has evolved into an expansive, impressive event, attracting over a million visitors from around the world each year. The festival begins in early January and runs until late February, with a packed itinerary boasting art fairs, winter sports competitions, concerts, and much more. In sheer size, it beats out other popular winter festivals around the world by occupying more than 600,000 square meters of winter fun for the whole family. It’s also one of the coldest festivals in the world: in Harbin, temperatures drop as low as -15°F, and that’s without wind chill. Artists begin work on their masterpieces well before the festival kicks off in early January - over 10,000 workers flock to the area to haul ice blocks, build their pieces, and polish their sculptures to perfection. The festival spans four theme parks. It’s like Disney World, but much, much colder. 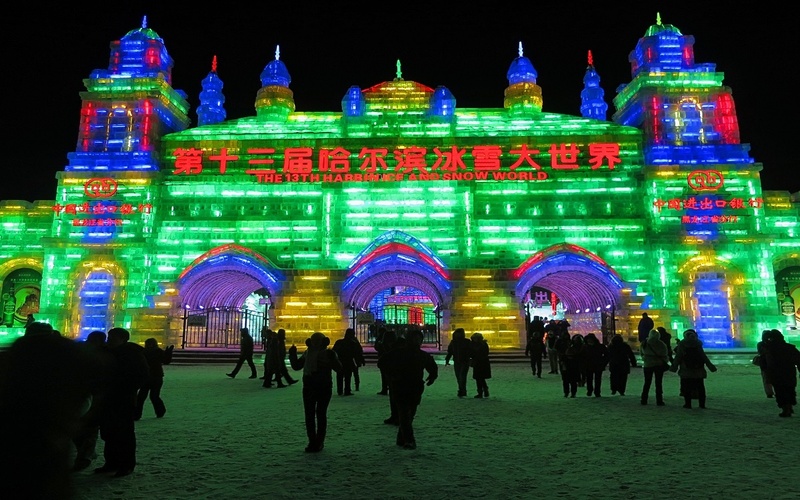 Harbin’s Ice and Snow Festival is divided up into four unique theme parks: the Sun Island International Snow Sculpture Art Expo, Harbin Ice and Snow Amusement World, Zhaolin Park Ice Lantern Fair, and Songhua River Ice and Snow Harbin Valley. Sun Island’s Art Expo is the heart of the festival, where visitors will find some of the most breathtaking snow carvings and large-scale sculptures (the tallest is 46 meters high!). Visit Sun Island during the day, but plan to hit Ice and Snow World at night - the impressive ice sculptures and architecture are decked out in beautiful lights and computer-controlled LED shows, offering can’t-miss light displays and stunning works of (frozen!) art. Zhaolin Park’s Ice Lantern Fair is especially popular with kids, showcasing thousands of ice sculptures and ice lanterns that depict beloved animals, fairy tale characters, and classic Chinese stories. The Songhua River Ice and Snow Harbin Valley (also called “Happy Valley”) is transformed into a winter sports recreation area, where families can take sleigh rides, snowshoe, play ice hockey, and much more. The Songhua River is key to making the magic happen. According to CNN Travel, the sculptures in Harbin’s Ice and Snow World alone require more than 330,000 cubic meters of ice and snow. Where does all that ice come from? In part, from one of Harbin’s greatest natural resources: the Songhua River. During winter, the river freezes over, resulting in an icy surface more than one meter thick. Artists turn to the river to chip giant blocks of ice for their sculptures, or to create their own ice blocks from the river’s flowing water below the surface. 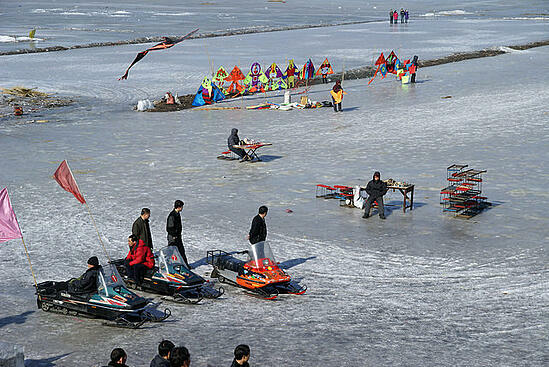 The river also serves as a source of recreation during the month-long festival: families take part in all kinds of winter sports, and certain brave individuals participate in swimming competitions in carved-out pools on the Songhua River. Personally, we’ll stick to the safety of a sleigh ride, bundled up with friends and family. Whether you’re already packing your bags for Harbin or planning to follow along from home, get in the spirit of the Harbin Ice and Snow Festival by practicing your Mandarin skills. In fact, Harbin is notorious for its use of standard Mandarin - students flock to the area to study the language. Thanks to Mango’s conversation-based, culture-packed Mandarin course, your learning is just a click away. How do you say “ice and snow” in Mandarin? There’s no time like the present to find out! Click "Find Mango" below to find out if Mango is available for free near you.